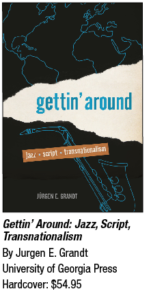 Gettin’ Around examines how the global jazz aesthetic strives, in various ways, toward an imaginative reconfiguration of a humanity that transcends entrenched borders of ethnicity and nationhood, while at the same time remaining keenly aware of the exigencies of history. Jurgen E. Grandt deliberately refrains from a narrow, empirical definition of jazz or of transnationalism and, true to the jazz aesthetic itself, opts for a broader, more inclusive scope, even as he listens carefully and closely to jazz’s variegated soundtrack. Such an approach seeks not only to avoid the museal whiff of a “golden age, time past” but also to broaden the appeal and the applicability of the overall critical argument. For Grandt, “international” simply designates currents of people, ideas and goods between distinct geopolitical entities or nation-states, whereas “transnational” refers to liminal dynamics that transcend preordained borderlines occurring above, below, beside or along the outer contours of nation-states.